The Elusive Eleven are primarily nocturnal animals that are rarely seen in African National Parks and Game Reserves. Only the sidestriped jackal is not nocturnal but you may be fortunate to see one of these animals by day either at dawn or dusk. If you get to see one or more of these elusive eleven animals while on safari then you have been massively blessed! The Aardvark is a medium-sized African mammal. Its name comes from the Afrikaans/Dutch for "earth pig" (aarde earth, varken pig), because early European settlers thought it resembled a pig. Aardvarks are nocturnal, usually waiting until dark before they emerge from their burrows to feed on ants and termites. We are yet to see an Aardvark. 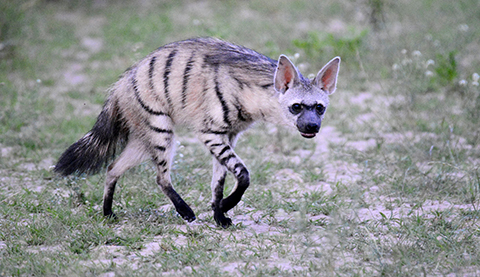 The aardwolf is a small mammal that looks like a striped hyena and is found in Eastern and Southern Africa. The name means "earth wolf" in Afrikaans/Dutch. Unlike other hyenas, the diet of the aardwolf almost completely consists of termites, which it feeds on at night. We have seen them primarily in Namibia while staying at Toko Lodge. In our first ten years of visiting the various African game reserves we saw no civets. 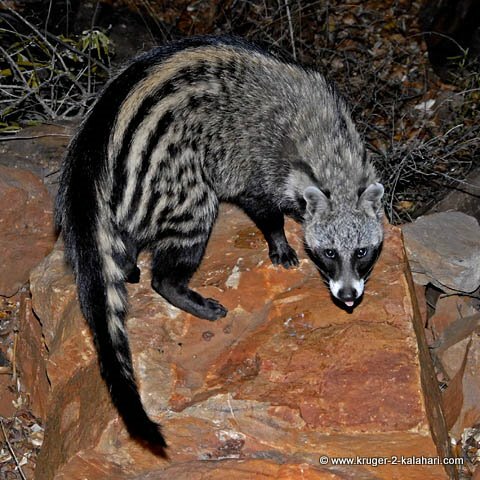 Then from 2007 We had about seven civet sightings - all in Punda Maria camp at night while we are braaing! We have seen African wild cats primarily in the Kgalagadi and Etosha - 2 sightings in Etosha and 2 in the Kgalagadi. 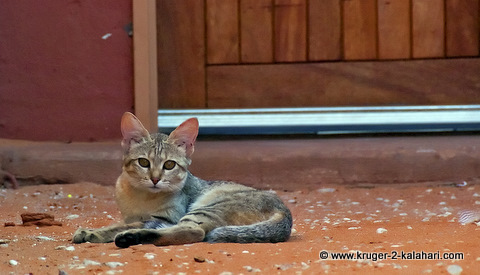 One lived under our dune cabin at Kielie Krankie wilderness camp and we would see her nearly every day. We would return from our game drive to find her at our front door! The Bushpig is a member of the pig family and is found in East and Southern Africa. Bushpigs are mainly nocturnal and therefore are seldom seen during the day. We have not seen a bushpig in the wild. 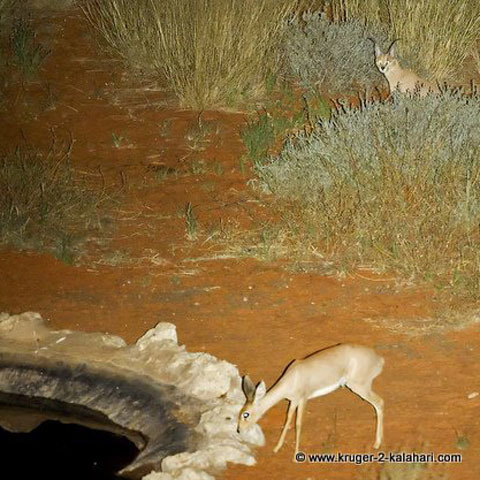 We have had just two caracal sightings - one in the Kruger Park near Satara camp and the other at Kielie Krankie wilderness camp in the Kgalagadi, where it was waiting to ambush a steenbok. 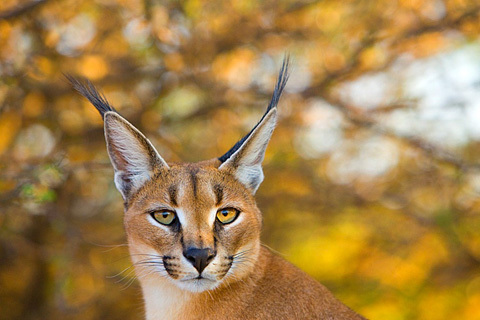 Check out our interview with Jim Zuckerman as he has an amazing portrait of a caracal that he photographed in Namibia while doing a photographic workshop. 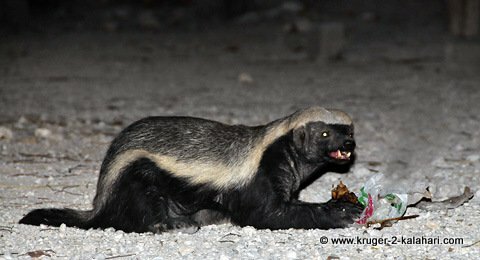 For our first 10 years of visiting African national parks we saw no honey badgers but then we saw our first one in the Kruger Park near Olifants camp. Since then we have had 3 other sightings in the Kruger - one near Punda Maria, and two more near Olifants. We have also seen them in Halali camp in Etosha. 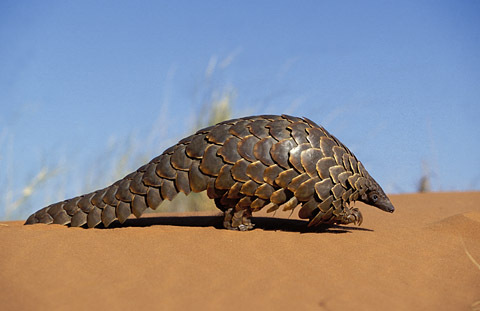 We are yet to see a pangolin. Check out our interview with Nigel Dennis - he has a superb photograph of a pangolin that he photographed in the Kgalagadi Transfrontier Park. 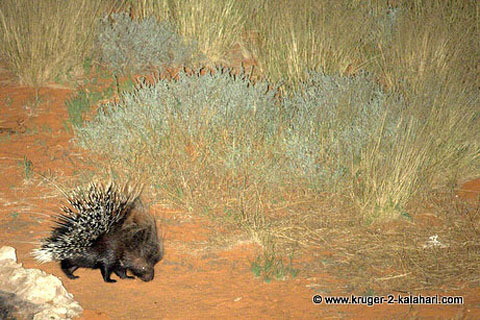 We have seen just three porcupines in all the years we have been visiting game reserves. We saw our first one at Tamboti camp in the Kruger park, our second one at Halali waterhole in Etosha and the third at Kielie Krankie wilderness camp in the Kalahari. We are yet to see a serval. 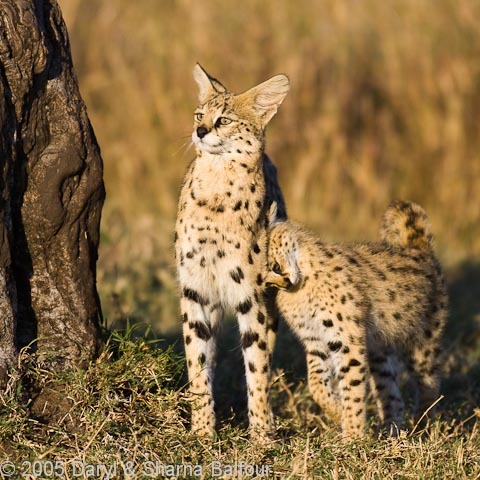 Check out our interview with Daryl Balfour as he has included a wonderful photograph of two servals that he took in the Kruger Park. 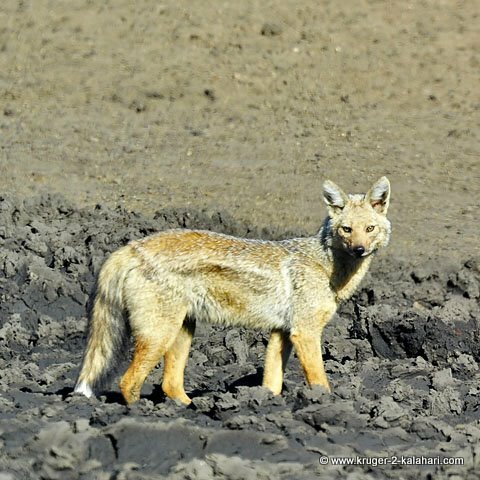 The sidestriped jackal can be confused with the blackbacked jackal - the sidestriped does not have a black back as you can see from the photograph above. It is easy to correctly identify animals such as side-striped/black-backed jackals or servals/cheetahs/leopards when you know what to look out for. We have seen three of these sidestriped jackals - one in the Pilanesberg and the other two in the Kruger Park. So, of the elusive eleven we have seen six of them (most were fleeting sightings at night) and we are still hoping to see the other five of the elusive eleven!